The U.S. government is ramping up immigration enforcement at workplaces. 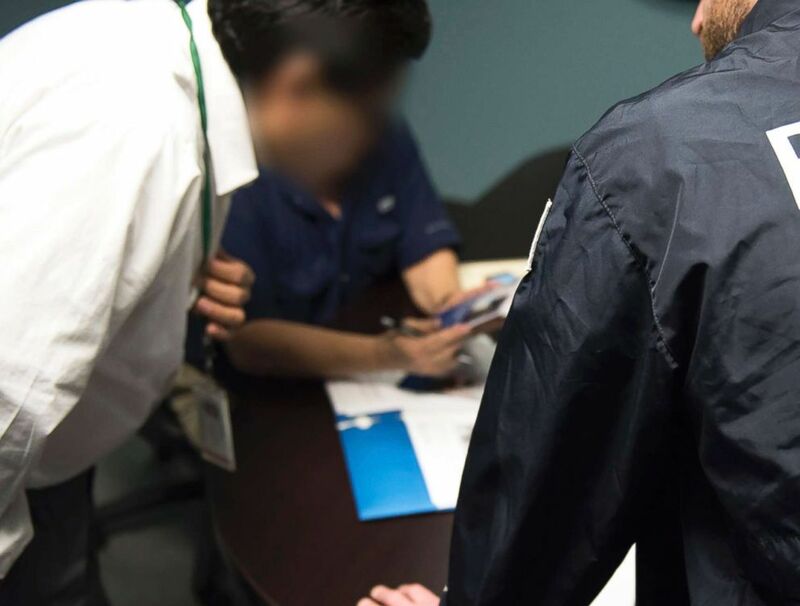 Immigration and Customs Enforcement has dramatically increased enforcement of workplace violations over the past seven months, making the most arrests in five years and doubling the number of open investigations. The effort has been championed by the Trump administration and has been carried out by federal agents across the country. But immigration advocates have accused the administration of violating detainees' Constitutional rights and creating an environment of fear in the immigrant community. Seven months ago, the now-outgoing head of ICE, Thomas Homan, issued a directive calling for increased enforcement at work sites to ensure a "culture of compliance." "Obviously there is going to be a human impact -- we are talking about human beings and people that are trying to make a living, but we are obligated to uphold the laws," said Matt Allen, assistant director of Homeland Security Investigations, which handles work-site-related immigration compliance. "We believe if we make it harder for people to get jobs, there's really no reason to come," said Allen, adding that while some illegal immigration is driven by people fleeing violence, the "vast majority" of people come to the U.S. for employment opportunities. "We are focused on an important part of securing the border, which is reducing the draw or the magnet." 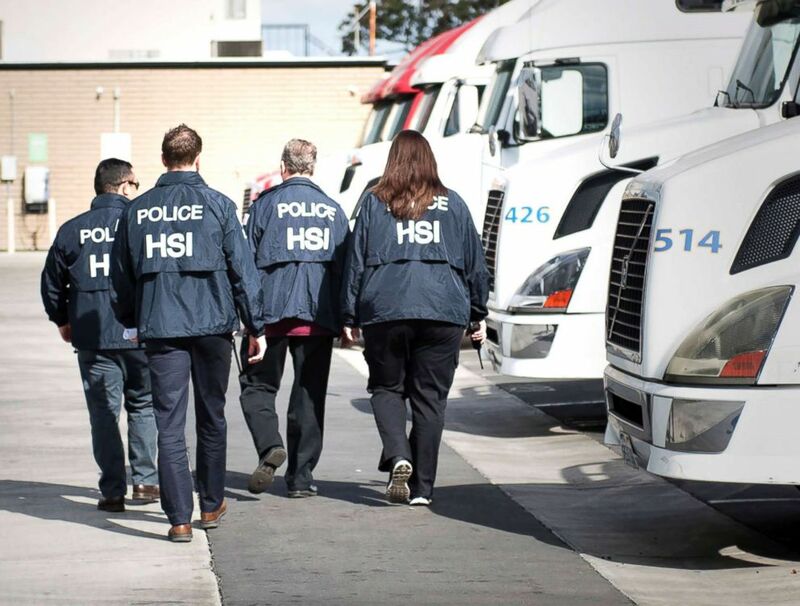 (ICE) Homeland Security Investigations agents from the U.S. Immigration and Customs Enforcement (ICE) are seen in this undated photo. Just last week, an ICE raid in the Mount Pleasant, Iowa, led to 32 arrests and sparked community protests. "This raid is devastating for the people who were detained, their families and the entire community," Erica Johnson, the immigrant rights program director for the American Friends Service Committee in Iowa, told the Des Moines Register. In April, nearly 100 people were arrested by ICE at a Tennessee meat-processing plant, which the National Immigration Law Center said was the largest workplace raid since Trump took office. In the aftermath of the raid, 500 to 600 children -- about 5 percent of the district's 10,000 students -- were absent from school in Hamblen County, according to the Tennessee Immigrant & Refugee Rights Coalition. "Our communities have lived under intense fear since the Trump administration began, and this raid –- coupled with local law enforcement involvement -– will send shockwaves across the country," Stephanie Teatro, co-executive director at TIRRC, said in a statement at the time. (ICE) A Homeland Security Investigations agent from the U.S. Immigration and Customs Enforcement (ICE) is seen in this undated photo. In January, ICE agents served notices of employment-verification inspection to 98 7-Eleven franchise stores across the country, resulting in 21 arrests. In December, when ICE announced its end-of-year arrest numbers, Homan said the agency would increase workplace enforcement by "four to five times" the current rate. While individual raids have garnered national attention, the new numbers released by ICE Monday give a clearer picture of the scope of the increase in the enforcement by the agency. Compared with 2017, workplace cases already have doubled. Since October, ICE has made 610 administrative arrests related to worksites. In fiscal year 2017, there were 172. ICE opened has 3,510 worksite investigations since October, compared with 1,716 from a year ago. ICE said it's shifted resources "to fill the gap" for the additional workplace investigations. The agency also is conducting audits that often go unseen, Allen said. "We are reminding employers," Allen said, "that they have a role and responsibility in the process."